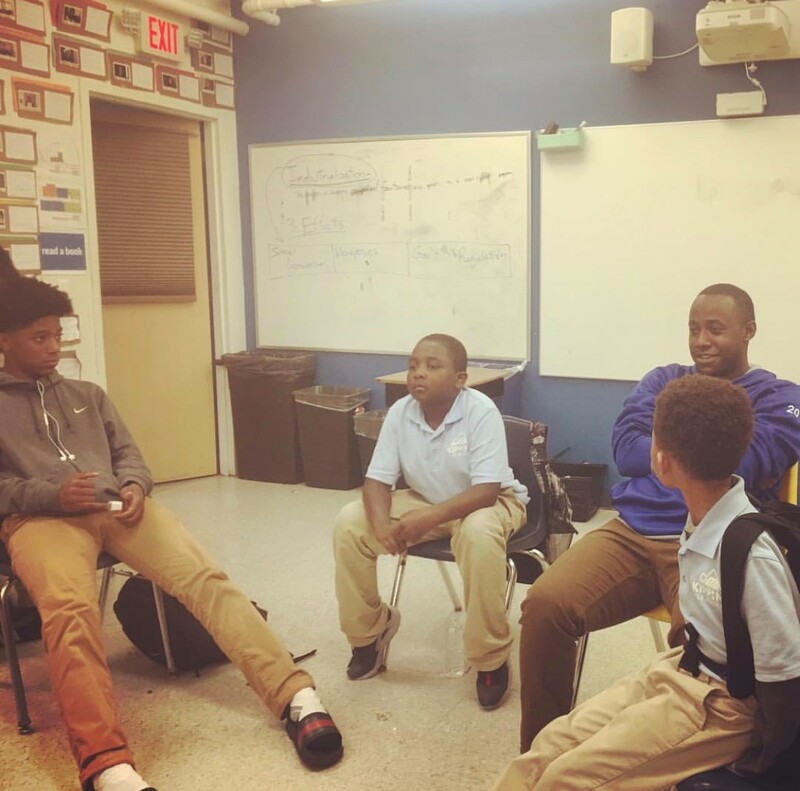 This is a guest post by Antwann Brown who is in his second year working at KIPP NJ Rise Academy where he serves as the Assistant Dean of Students for 5th and 6thgrade. Before joining KIPP New Jersey, he worked at the Children’s Defense Fund where he focused on building language arts and literacy skills to underprivileged youth in Columbia, South Carolina. Brown has spent his life living in Irvington, NJ and is a graduate of Benedict College. A few weeks ago, a group of 15 male students – 5th to 8th graders – sat in a circle in front of me, discussing instances of bullying they’d witnessed or experienced themselves, debating what it meant to defend each other, and discussing different methods of diffusing what could otherwise turn into violent situations. Halfway through our discussion, it became clear Tahir and Armand, two of my 5th grade students new to KIPP Rise Academy, were guiding the discussion. Tahir made it clear he saw the value of defending his fellow students, but – wise beyond his years – explained that violence wasn’t the best way to solve problems. “You don’t have to retaliate with your fists… we can keep people safe from bullying,” said Tahir. This is sadly a typical conversation among my students. Twice a week, through a program called M.A.L.E.S. – Modeling Altruistic Leaders in Excellence – students gather in a safe space to tackle issues they might be experiencing and learn skills they might not have learned otherwise to deal with those issues. It’s important for the kids to see they are not alone; that there are other students their own age going through the same thing. And that’s extremely comforting and validating. The inspiration for this program came from the students. We are fortunate that our school has many co- and extra-curricular clubs, which encourage our students to think outside the box, be creative and expand their horizons. Our male students, who see the breadth of clubs and want to expand their options further, asked for a “community building” club geared toward them. They wanted a space where they could be heard, where they could spend time problem solving collaboratively in a supportive environment that was designed to meet their needs. Through M.A.L.E.S., these students now have access to a group that helps shape them into the leaders they strive to be, teaches them to be mentors to each other and improve their communities – be it in the classroom, on the playing field or at home. We’ve held sessions on dressing for success, building resumes and respecting the women in their lives. We bring in different speakers every week, to show them there are a myriad opportunities waiting for them when they graduate. I’ve been able to bring in friends who work at the NBA, local DJs who now travel the world performing and someone who works with Jersey City Emergency Services and Police Officers. After these conversations, students began to develop “dream boards” that illustrate where they might like to travel and things they might like to do when they grow up. Lately, we’ve even been working on bringing someone from Mayor Baraka’s office in to speak with the students, to show them how important it is to be civically active and give back to the community. We’re teaching our students that they can accomplish anything if they put their mind to it; that the sky is the limit. After our sessions, we see students implementing things they’ve learned in their daily lives. After the tie tying sessions, half of my students showed up to school wearing ties. They understand that one doesn’t need to be an adult to be a role model or advocate for oneself. They look to each other as resources now. The older guys head down to talk to the 5th graders during lunch to ask how their day is going and to give advice. Each session is an open discussion, and every week they impress me with their insights, growth and maturity. We know that, for many of these students, this is an invaluable opportunity to get advice, feedback and support. We are so proud of what we’ve created and can’t wait to see what these scholars continue to create, with access to a male community focused on empowerment and support. We understand that, in a city like ours, men are rarely empowered to be vulnerable or express emotions. Here in our school, we’re proud to provide a space where young men can feel free to be who they are, and know they are both respected and heard. Previous PostJust How Deeply is Murphy’s Agenda Influenced by NJEA? Here’s a Clue. Next PostNJ DOE Watch: DOE Commissioner Repollet Cancelled All School Audits and The Feds Don’t Like It. Will Gov. Murphy Take Action?